A very winding and remote mountain drive across the dramatic Wollondilly River valley from Mittagong to Richlands, through rural countryside and bushland. Tight bends with steep drops off the side of the road. Can be used as a more adventurous ëshort-cutí alternative to the main Greater Blue Mountains Drive through Goulburn. Extreme care required. Suitable for experienced country drivers only. 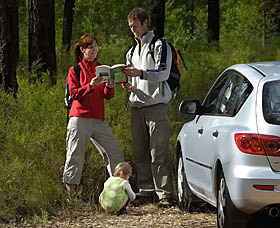 This discovery trail heads west from Mittagong, across the Hume Highway expressway and onto Wombeyan Caves Road. The road at first travels through plateau farmland then through a tunnel to reach Wollondilly Lookout. Take a break to enjoy views of the Wollondilly River valley before tackling the descent to the river. The road changes character dramatically is it winds around steep slopes into the gorge, with the bluff of Perpendicular Rock towering overhead. Extreme care needs to be taken on the many tight bends that continue all the way past Wombeyan Caves. Always assume there is another vehicle coming the other way! The road crosses the Wollondilly River at Goodmans Ford before gradually climbing up the steep terrain of the Jocks Creek valley and down into the valley of Wombeyan Caves. At Wombeyan Caves you can camp or picnic in the spacious grounds or hire a cabin. Self-guided cave tours are available anytime, with guided tours scheduled regularly. There are also several interesting walking tracks and a kiosk. Contact 02 4843 5976. After enjoying Wombeyan Caves, follow the road west out of the valley and up onto the rolling countryside of the Central Tablelands. After 21km from the caves, you'll reach Richlands and the Abercrombie Road (which is followed by both the Tablelands Way and the main Greater Blue Mountains Drive). At Richlands you can turn left (south) to the historic village of Taralga (9km) or right (north) to continue on the Greater Blue Mountains Drive, across the Abercrombie River to Oberon.